Been toying with the idea of a lizardman army with a difference for a little while now. I remember seeing reptiliads from RaFM over 20 years ago and liking but being able to buy any. Apparently the collective name for crocodiles and sometimes reptiles in general is a Bask... well you live and learn! 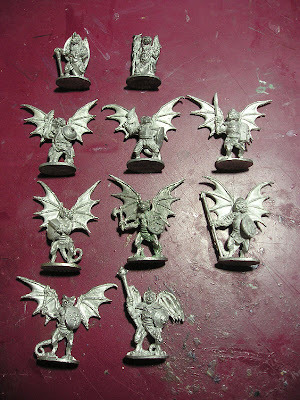 So they will form the basis of the army along with some Tom Meier Lizardmen from citadel and also his troglodytes. I want to do something a little more unusual so I'm also going to use the Grenadier Dragonmen as an arial threat. Dating from the mid 1980's these are long OOP but do come up on ebay. I can't find pictures for all these figures on line but I understand that there were 4 different blisters produced making 12 figures and I have 10 of them (and some more on the way from eBay). If anyone has any info on the two I am missing thn info greatly received.